When you hear the term “rugby-playing nation” you might immediately think of New Zealand, Australia, South Africa and the traditional European powerhouses. But in fact, rugby is played in more than 120 countries with over 8 million rugby players registered in competitions across Europe, Africa, the Americas and the Asia-Pacific. Here are some of rugby-playing nations that might not immediately come to mind. South America’s most populous nation has won more football World Cups than any country, but it may only be a matter of time before Brazil is competing in the Rugby World Cup. Women have led the way in the sport’s growth, with Brazil’s national women’s sevens team the top side in South America. Rio de Janeiro’s hosting of the 2016 Olympic Games, where rugby sevens debuted, also helped to boost the sport’s popularity. Progress is starting to translate on the scoreboard. In 2016, the men’s 15-a-side team scored its first-ever win against the USA in a match in Sao Paulo. Brazil still has a long way to go to catch up with neighbouring Argentina, which made the semi-final of the 2015 Rugby World Cup, but there are signs that this football-mad country is finding room for rugby. Recent years have seen rugby’s popularity growing in Asia. The success of rugby in Japan, which is hosting the 2019 Rugby World Cup, is testament to this. 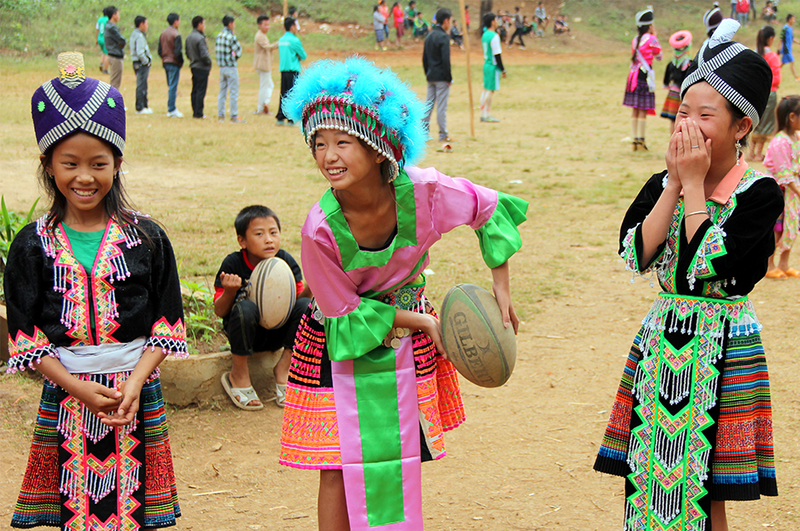 In Laos, rugby is providing to be hugely popular with girls and young women, thanks to ChildFund Pass It Back. The Lao Rugby Federation was formed in 2001 and has become an associate member of World Rugby, an important step to eventually becoming eligible for World Cups. ChildFund Pass It Back can also trace its beginnings to Laos, where it’s unique curriculum, integrating tag rugby and life skills learning, was first trialed to help young people in a range of areas including leadership, problem solving, gender equity, conflict resolution and planning for the future. Introducing a previously unknown sport like rugby into communities in Laos encourages girls to take part, as it is not traditionally seen as a ‘boys’ game. Today, over half of all ChildFund Pass It Back coaches and players in Laos and other Asian nations are female. The former Soviet nation of Georgia has a rugby connection that goes back generations to a traditional folk sport called lelo, which bore similarities to modern rugby union. Although Georgia has a population of less than 4 million, it punches above its weight in international competitions. The Lelo (the nickname for the national team) have competed in the last four World Cups, and earned automatic qualification for the 2019 World Cup by finishing third in their group in 2015. The country’s dominance over the Six Nations B Tournament (Europe’s international second-tier) has even resulted in a push for Georgia to join European rugby’s annual Six Nations tournament alongside England, France, Ireland, Italy, Scotland and Wales. South Africa is without a doubt the continent’s most competitive rugby nation, but the sport has been growing in many African countries in recent years. Africa is home to almost 650,000 registered rugby players in 23 countries, many of which are becoming more competitive on the international scene. Rugby arrived in Kenya more than 100 years ago when a team consisting of mainly British officials competed against a team of Afrikaaners in Mombasa. The sport did not take off in Kenya like it did in South Africa, but the tide could be turning thanks to the success of the East African nation’s rugby sevens team. Kenya has become a force in the seven-a-side format, finishing third in the Rugby Sevens World Cup in 2009, and has competed strongly on the international sevens circuit each year. The popularity of the national team has led to an increased interest in rugby in Kenya, pointing to a bright future for the 15-a-side game. Did you know that the United States is home to 120,000 registered rugby players – more than Ireland (101,922) and Wales (83,120), two of the world’s most competitive rugby countries? Rugby has always been a niche sport in the US, but it has become more mainstream in recent years. In 2016, New Zealand and Ireland took one of their test matches to Chicago’s Soldier field and attracted a capacity crowd of 63,000 fans. In recent years, sevens tournaments in the US have been attracting crowds of over 100,000. World Rugby has already flagged the US as a potential host for an upcoming World Cup, indicating the important role it will play in the coming decades. There are many children in South East Asia that still don’t have access to organised sporting programs. By donating to ChildFund Pass It Back, you will help children learn and grow through an integrated rugby and life skills program. Donate now, and pass a child their future. ChildFund Pass It Back is a sport for development program managed by ChildFund Australia. It is supported by the Australian government.